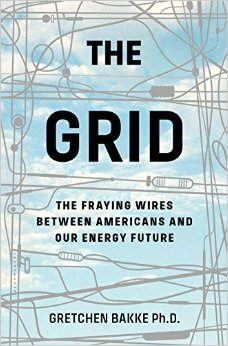 Gretchen Bakke discusses her terrific new book, The Grid: The Fraying Wires Between Americans and Our Energy Future. It’s about how our outdated electrical grid is holding us back from making the crucial transition to renewable energy. There’s no question that we need to transition fast to 100 % renewable energy if we are to escape the worst consequences of climate change. There’s also no question that such a transition would be great for our faltering economy, creating millions of jobs here at home and around the world. But getting there isn’t easy. It’s not just the vast power of the fossil fuel industry that’s slowing us down. It’s the dead weight of a 19th century electrical grid that is woefully unsuited to a 21st century clean energy system. Gretchen Bakke tells the whole fascinating story of how that came about, what it means for us now and how we can break free of its chains in her new book The Grid. Bakke is a cultural anthropologist. On her website, she describes herself as “interested in what people do when the systems they rely upon stop working.” And the subtitle of her book, The Fraying Wires Between Americans and Our Energy Future, reflects her perspective on the grid as a cultural phenomenon, embodying the power relationships of our society as much as the engineering of power transmission. Bakke even makes the engineering part gripping reading, showing why the nature of electricity itself sets the parameters of how society solves the problems of generating and storing power. But how we operate within those parameters is the crux of Bakke’s story — and that is entirely up to us as a society. From smart grids to microgrids — and even the nanogrid you might put on your roof — she shows that we have choices to break free from the crumbling monster that brings us our power today. Gretchen Bakke is assistant professor of anthropology at McGill University in Montréal, Canada. The Grid is published by Bloomsbury.